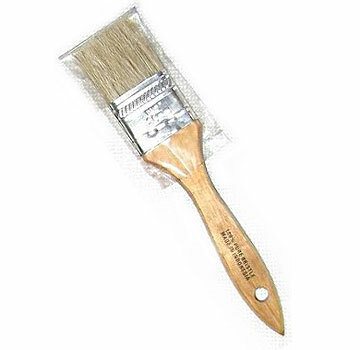 PRODUCT: 1-1/2 inch wide x 5/16 thick Natural Bristle Paint Brush / Chip Brush / Pastry Brush. Set in wood handle. 36/Box. Price/Box. Features 100% natural un-dyed tapered natural bristles that are securely locked in epoxy cement and plain wood handles. Recommended for applications using petroleum or solvent based materials, roofing cements and tars.